Kenya's opposition party called for a new presidential election to settle a disputed vote that has sparked day of deadly riots, and small groups of protesters were gathering on street corners in the capital's slums Friday to prepare for a rally. Anyang Nyongo Secretary General of the Orange Democratic Movement, said the country should ready "for a new election of the president." With the call, the opposition appeared to leave little room for compromise with President Mwai Kibaki, who was declared winner of the Dec. 27 vote on Sunday, setting the stage for more political tension. "This is about a democracy and justice," Nyongo said. "We shall continue to defend and promote the right of Kenyans so that the democratic process should be fulfilled." Earlier Friday, Kenya's embattled opposition vowed another day of rallies, raising the specter of more violence amid a political deadlock between the president and his chief rival who claims the closest election in the country's history was rigged. The U.S. and Europe pushed for reconciliation, but said a "made-in-Kenya solution" is needed to end the violence that has killed 300 people and displaced 100,000 since President Kibaki was declared the winner of the Dec. 27 polls. Jendayi Frazer, the top U.S. diplomat for Africa, had planned to leave Thursday for talks with Kibaki and opposition leader Raila Odinga, State Department spokesman Sean McCormack said. Frazer would not serve as a mediator, but would try to encourage the leaders to talk, McCormack said. 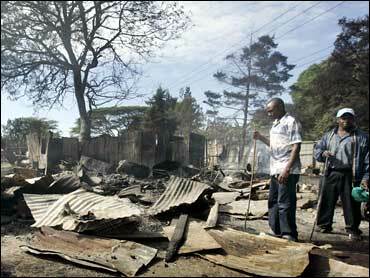 CBS News reporter Katherine Arms reported that Nairobi was largely calm early Friday. However, Salim Lone, a spokesman for opposition chief Raila Odinga, said "we are not going to give up our right to assemble peacefully." "We will not back down until there is a clear solution for the crisis caused by the stolen election," Lone said. Kibaki has said he is "ready to have dialogue with concerned parties once the nation is calm and the political temperatures are lowered enough for constructive and productive engagement." South African Nobel peace laureate Desmond Tutu met Odinga in Nairobi Thursday, saying afterward Odinga was ready for "the possibility of mediation." Kibaki's office said the president was expected to meet Tutu Friday. Government spokesman Alfred Mutua, however, said Kenya had no need for mediators. "We are not in a civil war," he said. Arms said people living through the nightmare, which has led to shortages in food, basic supplies and the closing of schools in the capital until Jan. 15, were fed up. In the Mathare slum in Nairobi, Ruth Otieno said Friday about 60 houses were burned down overnight, displacing scores of families. On Thursday, riot police fired tear gas and water cannons to beat back crowds of opposition protesters in Nairobi, where postelection violence in what had been one of Africa's most stable countries left shops, homes, cars and at least two churches in flames. The violent images - of burning churches, machete-wielding gangs, looters making off with petrol - are heartbreakingly common in a region that includes war-ravaged Somalia and Sudan, but not in Kenya. The dispute over the Dec. 27 vote has degenerated into violence pitting Kibaki's influential Kikuyus against Odinga's Luos and other tribes. The upheaval has spread to the coast to the western highlands. Hundreds of young men marched Thursday in the coastal resort of Mombasa but were quickly driven back by security forces. Police shot one protester in the head and he was taken to a hospital, said witness Moses Baya. "War is happening here," said 45-year-old Edwin Mukathia, who was among thousands of people who poured out of Nairobi's slums Thursday to heed Odinga's call for a million man march in the city's Uhuru Park. Mukathia and the others were kept at bay by riot police, who choked off the roads and fired live bullets over their heads. Opposition leaders canceled the march but said they would hold it Friday, setting the stage for yet another day of upheaval. Kenya's electoral commission said Kibaki had won the Dec. 27 vote, but Odinga alleged the vote was rigged and international observations say it was flawed. On Thursday, Attorney General Amos Wako called for an independent probe of the counting. Wako did not elaborate or say whether an independent body would include foreign observers, and it was unclear whether he had Kibaki's backing or had made the statement independently. Wako, who was appointed to his lifetime post by former President Daniel arap Moi, has been seen as close to Kibaki. The decision to launch an independent election probe was a surprise and could reflect the seriousness of the rigging allegations. But the government has a long history of appointing independent commissions to investigate wrongdoing, only to have them take years and end with reports that are never released and have no practical effects. Mutua told The Associated Press he had "no problem" with Wako's call. But Odinga's spokesman, Salim Lone, rejected it, saying his party had "no faith in any government institution." Also Thursday, Odinga toured Nairobi's City Mortuary, which was full of piles of bodies of babies, children, young men and women. Some were burned, while others had head wounds. Many did not have visible wounds. It was unclear when they had died, but opposition officials said some were killed Thursday. "What we have just seen defies description," Odinga said after the visit. "We can only describe it as genocide on a grand scale."